Shred Optics started out as a snow sports eyewear and protection company born in 2006, co-founded by Olympic alpine skier Ted Ligety. The company has since expanded to include plenty of mountain biking products, including the Short Stack mountain bike helmet pictured here. 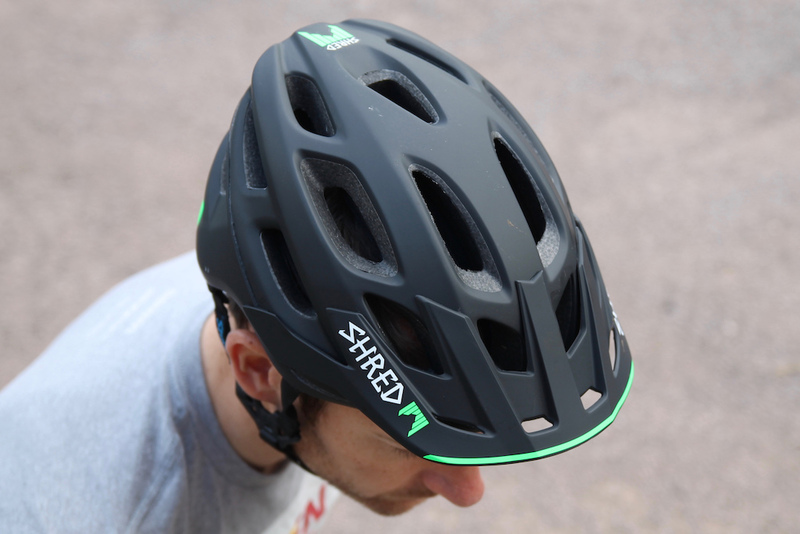 It’s clear that safety is paramount for Shred, and the helmet packs some interesting technology designed to provide extra protection in the event of a crash. The helmet is constructed with a co-molded NoShock 2nd Skin XT, the company’s own special honeycomb foam that offers similar deformable and energy absorption properties to D3O. It’s embedded into key areas of the helmet lining. You can see the NoShock foam integrated into the EPS foam because it is handily colored blue. 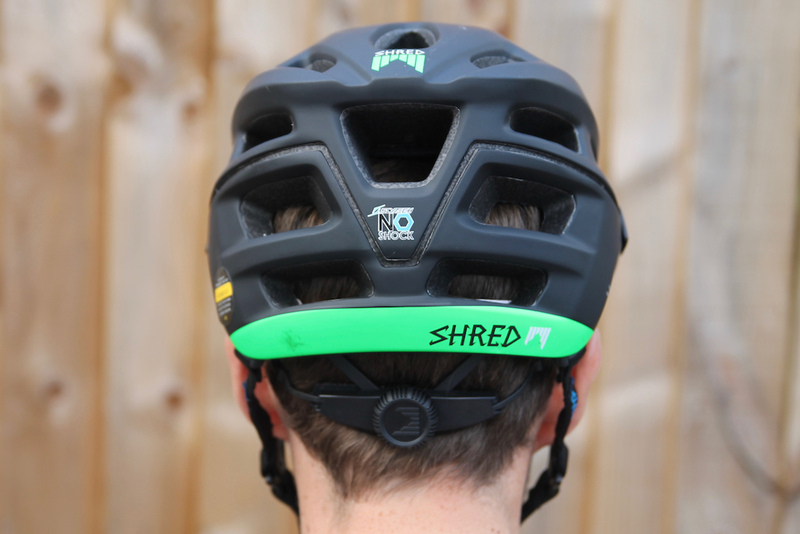 The shape of the helmet echoes that of other popular trail helmets - with a lowered rear section to provide extra protection to the back of the skull - but sticking to a well-proven shape is no bad thing. There are 20 vents, with four channels across the top of the head, and some very larger rear vents. The retention system is operated by a small ratcheting dial, and the chin straps emerge directly out of the side of the helmet, placing them away from the skin to increase comfort. 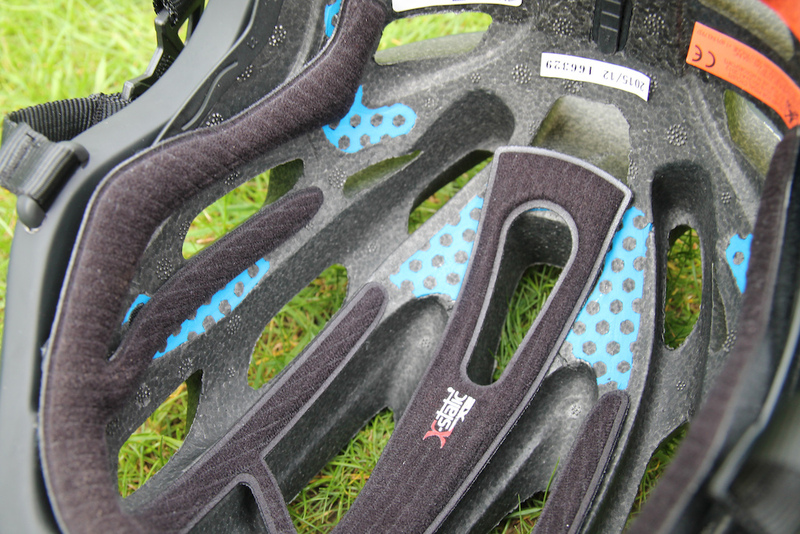 There’s a non-adjustable peak, and the helmet is lined with X-Static pads that are removable for washing. 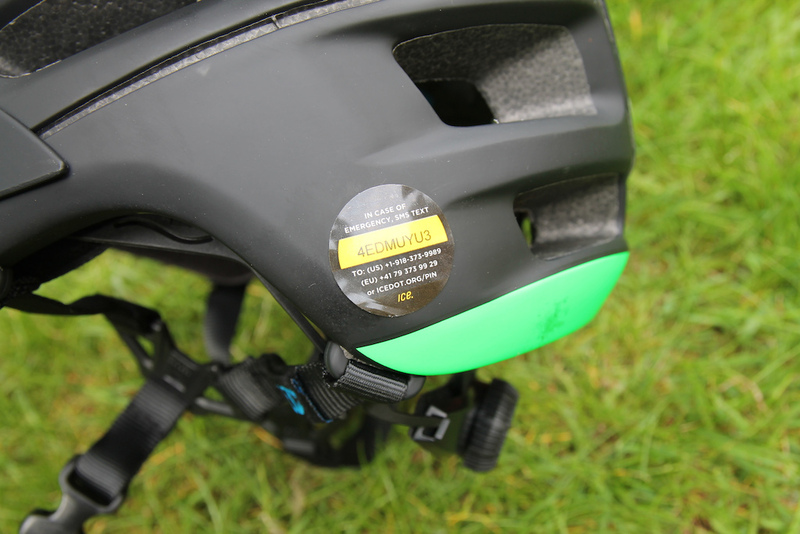 Further highlighting its quest for safety, Shred includes an ICEdot emergency identification and notification ID with each helmet. You just need to go to the website and register it using the code revealed by peeling back the sticker. The ICEdot website can store emergency contacts and medical details like blood type, medications and allergies, a useful thing especially if you ride solo a lot. The Short Stack is available in two sizes: X-small/medium and medium/X-large (the XS/M tested here covers sizes from 53 to 57cm) and in six colors. MSRP is $159. The ratcheting retention dial provides a wide range of adjustment. 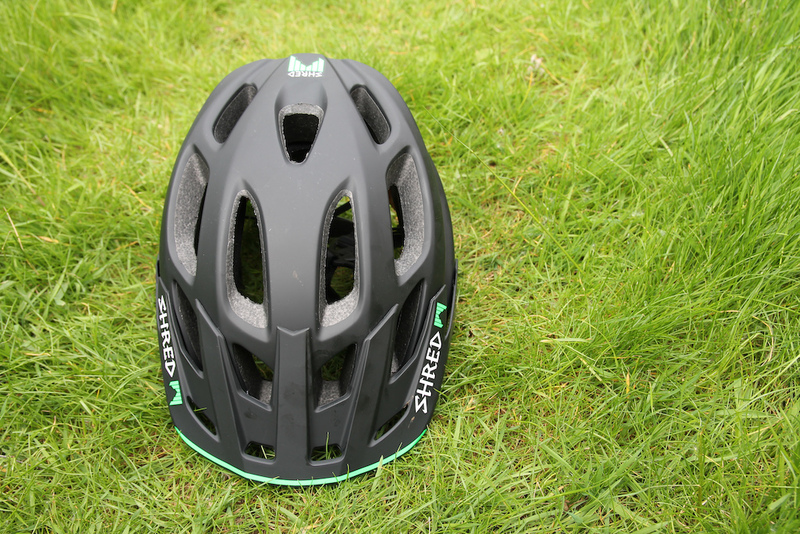 It's a smart looking helmet, with 20 vents and fixed peak. Shred offers the Short Stack in a choice of two sizes. I went for the medium and it fitted my average shaped head well, and the easy-to-use retention system offers a wide range of adjustment. Despite being my normal size, I found the helmet a closer fit than similar sized helmets from Fox and Poc, but the closeness of the fit never led to any undue pressure. On the flip-side, the helmet was extremely stable on my head, with absolutely no fore or aft movement. The chin straps come directly out of the side of the helmet, keeping them away from the skin and minimizing irritation, and that also means there’s no interference when wearing sunglasses. The plastic brackets fixing the straps together aren’t adjustable, but they sat just below my ears without causing any discomfort. I usually lament the lack of adjustability in a fixed-position peak, but Shred has got the angle just right, as it never obscured vision and I never felt the need to adjust it. Blue NoShock 2nd Skin XT material is molded into the EPS liner. You get an ICEdot ID included in the price of the helmet. The NoShock foam embedded into the helmet is designed to provide added impact protection, working in unison with the EPS foam that makes up the majority of the helmet's construction. It’s only used in key places inside the helmet, presumably where Shred has tested and decided there are the high-risk areas. While the helmet passes the usual EN 1078 and CSPC safety standards, there’s no available data on how much the technology helps to reduce the severity and force of an impact compared to a helmet without the special foam, and I’m not willing to throw my head at a rock garden to find out if it’s any safer for you. We’ll just have to take the company’s word for it, with a pinch of salt. The only issue I had with the helmet is that, while it breathes adequately, the brow pad doesn’t manage sweat very well and becomes quickly saturated. It just held onto the sweat and slowly released it down my face, usually just before I dropped into a steep and tricky section of trail. If this was a problem in the barely mild weather of the UK spring, I hesitate to imagine what it might be like in the high heat of summer. I put this sweating issue down to the close fit of the helmet. Luckily, the pads are removable, so you can toss them in the washing machine. Finally Shredz is into MTB industry. Next you'll see every Aaron Gwin photos there will be Shredz shaker beside. I've got this exact helmet and love it. Light, comfortable and looks pretty rad accompanied by some green tint goggles. Would have been dope to have seen a shot of it from the front. Looks like a good lookin' lid though. Not on a head, but better than nothing. Seriously. A helmet review without photos of how it looks on a guy from the side and the front seems very incomplete. @j-t-g: I've always found the spoiler essential for giving me the extra down force I need in the corners.. I was wondering that too. I'd also worry that people might think this helmet is ok to continue using after a crash if it has the D30 type material. the other issue is the temperature. lately in a knee-pad review some people stated that in low temp the foam is hard and does not provide the same amount of shock absorbing. This allready hurts my head just thinking of it. Would be interesting if shred has something better as they startet with snow-sports? Yes it is because the hard peice compress a greater area of foam is the same crash. First ive heard about the ICEdot thing. Sounds like a good idea if others know to access it in an emergency! ?? At 39 years of age I'm to old to be wearing anything with the word 'Shred' on it. Probably cool if your 12 or you can actually shred. Just imagine it means shredding papers in the shredder next to your cubicle. haha ready to wipe my arse with. I really like this idea, definitely a top contender for my next helmet. Price is reasonable as well, was expecting much more. i dont want my helmet to say "shred" on it. It's not like they have to pay engineers to ensure their designs are structurally sound and adhere to legal standards. ICEdot is the pinnacle of a mom invention. I could see my mom inventing that. Wow this is rad! I'm sharing this with the MTB community on www.soulid.me asap! I felt this was lacking in photos. Hard to get an idea for what this lid looks like with the pics provided. Ted Shred is the man. Awesome skier. Visor looks too short. Isn't going to block sun low on the horizon. What is going on with the Industry? How come no new helmet "standards" .We have got thousands of wheel size/width "standards" and millions of confusing hub size "standards". Looks like they are missing out on helmets....im dissapointed. Really? $159usd is priced favourably compared to a lot of the AM style helmets currently for sale from the major helmet manufacturers. Helmets are one thing I'm happy paying my hard earned on, given that they might save my life, or at the least save me from some serious head trauma. @Kiwiplague: It's understandable to pay extra for protection, but the markup on helmets are ridiculous. It costs a couple of dollars to make this, and then almost a 10,000% markup! Many of these helmets go on sale, and the price drops to around $30. In that $30 the bike shop is profiting, the whole sale vendors are profiting, and the companies making the product are profiting. It's insane to pay $159 for this helmet. @Kiwiplague: I do not think that you need to spend 160 dollars for a helmet that do its work right. I think that there is a point in price where helmets just get expensive for others reason that are not neccesary better protection. A cheaper idea to save your life or avoid injuries is to imagine that you are not using a helmet so you do not take more risks than normally, wich you would take if you have an expensive helmet in your head. I didn't know there was a helmet review season...?